We can provide training for young leaders, we also welcome students who would like some experience working with children before starting their employment in education. Most modules can be done on line including Safeguarding and Safety. Just print the certificate out when complete, have a chat to your training advisor to have it validated and then your record will be updated. See what leaders who have attended courses have to say. I went on the Nights Away weekend at Caeathro and really enjoyed the experience, coming from a non scouting background everything was new to me but I was included in everything and instantly became one of the family! I put up a tent by myself, made a fire and cooked an egg on it in a tin can and tied knots all for the 1st time. I must say that I will never forget that weekend – and all my friends know that too!!! The Module 38 course is not essential but it is recommended that all leaders who require a “Nights Away Permit” should attend, below is the information on how to gain a permit. The Permit allows competent adults who have demonstrated they have the right skills and attitude to lead events, without seeking any further permission. The information below is here to give an overview of the Nights Away scheme and provide resource links to aid in the Nights Away scheme. Indoor – for any Sleepover, indoor Pack Holiday, youth hostelling or similar event. Camp Site – camping on sites where there are toilets, water and waste disposal facilities. Green Field – for camping where all facilities need to be provided by the camp team – for example, a summer camp on a farmer’s field. Lightweight Expedition– for staying at any site for not more than one night before moving on. The core activity is a form of expedition, not residential, and all the equipment is transported with the participants. i.e. 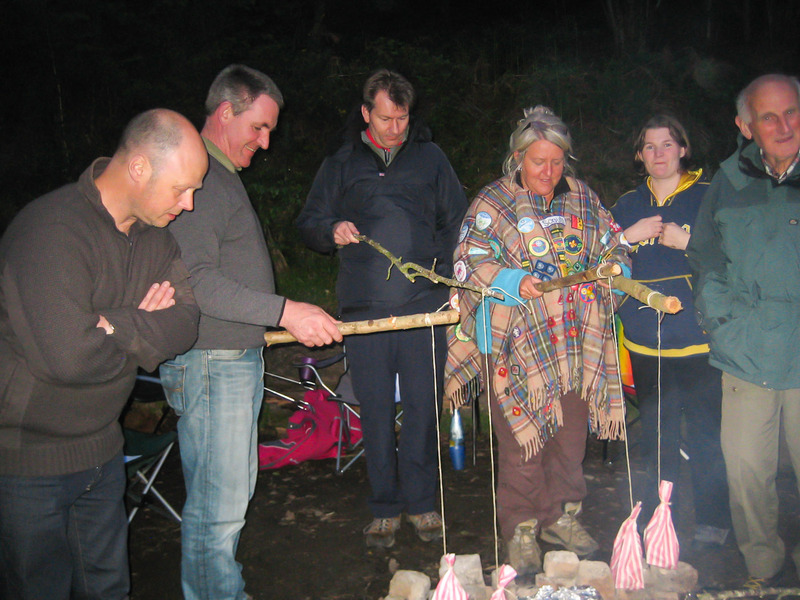 QSA/DOFE hikes, expedition hikes, canoe expeditions. An individual who gains a Green Field Permit is entitled to lead nights away events in the other three categories. Similarly, where an individual gains a Camp Site Permit, they may also lead Indoor events. An adult wishing to gain a Permit should first read factsheet FS120801 (Nights Away Permit Scheme – Applicants’ Guide) and then download the application form from the links below. This Application Form is to be used to apply for a Nights Away Permit in any category. It can be filled in online to be sent as an email attachment to speed up the process if required, or printed off and sent as a hard copy. Details of the different types of category permit it is possible to apply for can be found in the factsheet FS120800 Nights Away Permit Scheme. One of the first things you need to do is start a file on all the Nights Away events you have attended and in what role, also keep copies of programmes, catering arrangements etc even if you were not responsible for them. Be careful not to be constantly telling off the disruptive child as this will make them worse. It’s much better to praise the child when they do something right. If we do tell them not to do something then give a reason why they should not do it. Avoid a one to one confrontation but use peer pressure to settle any disputes when your sections Code of Conduct can be consulted. Try and have a list of do’s rather than don’ts on you Code of Conduct. If a member continually affects the smooth running of your meeting then it’s better that they asked to leave rather then lose some of your other members and possible leaders / helpers as well. We need to inform our GSL or DC if we intend to ask a member to leave. If the young people respect our leaders and helpers then the chances of poor behaviour is reduced. If we are not respected then perhaps we need to look at our discipline but be careful not to rule with a rod of iron. Prevention is better than the cure so don’t have free time, keep them busy and involve all your section members in the planning of future programmes. In your planning meetings have a large wooden spoon so that only the holder of the spoon is allowed to speak. If you run a game where people get “knocked out” then arrange something to do for those out of the game. If you have tried everything then ask your GSL or a leader from another section to attend one of your meetings. Talk to the parent and agree that the problem child could perhaps attend part of the meeting for a while. Keep your ceremonies short and strict; this is the one occasion when you can rule with a rod of iron. Don’t use ceremony time to give out notices. Correct discipline at the ceremonies will help in promoting good behaviour for the rest of the meeting. Parents should be invited to their child’s investiture ceremonies and together with any helpers should be asked to stand during the promise and prayers, it is vital that our ceremonies are correct and conducted with professionalism. (check your Colony, Pack or Troop Essentials). All leaders should be included in ceremonies and not left chatting away at the back of the room which is unacceptable behaviour.